Amy is angry at her father who has remarried and seemingly forgotten about her troubled mother who committed suicide. She is so determined to make a statement to her distant father that she purposefully blows her final exams and any chance she has to get into the next level of school. With no prospects in the future her dad takes the family on a one year trip around the world on a private yacht. At first life on the boat is a bit boring as Amy broods and gets annoyed at the staff. But things change drastically when the yacht is seized by a group of Somali pirates who won't learn their names but instead give them each a number. The pirates demand millions of dollars in ransom and the family, crew and pirates are forced to live together aboard the boat for several weeks while the details are worked out during which time Amy begins to bond with the youngest pirate, a boy only a few years older than her. Although the pirates live by a code that forbids them from harming the hostages, there is no doubt that they will kill if their demands are not met. 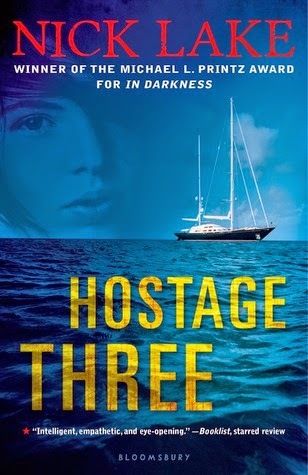 This is a gripping, too true story of modern day pirates. I had a hard time putting it down. I am, however, a little dismayed by Amy's relationship with the pirate. I'm not sure if it is a little too fairy tale-esque or not. It seems like the relationship is romanticized but then again, there are definite reminders of who and what he is. Overall, a good read.